When my maternal Grandfather (Dr. L. E. Green, of Mississippi) was nearing death, he gave me his Grandfather’s (hence, my great-great-grandfather’s) fiddle. It was, coincidentally, the violin on which my mother had also learned to play. 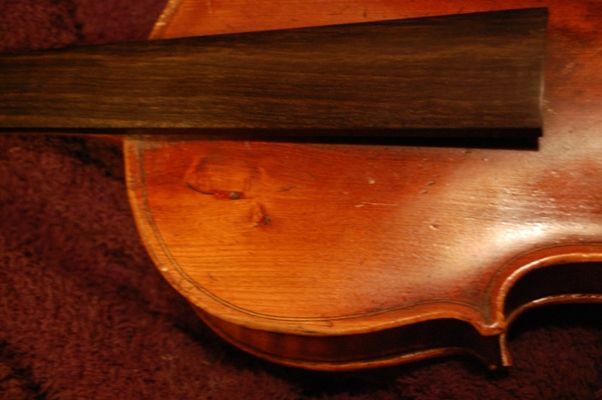 She had later been given a much better violin when she graduated from college, but this is the one her great-grandpa Gray played, and the one she learned on. I had been told about it, but had not seen it until it arrived at my house. 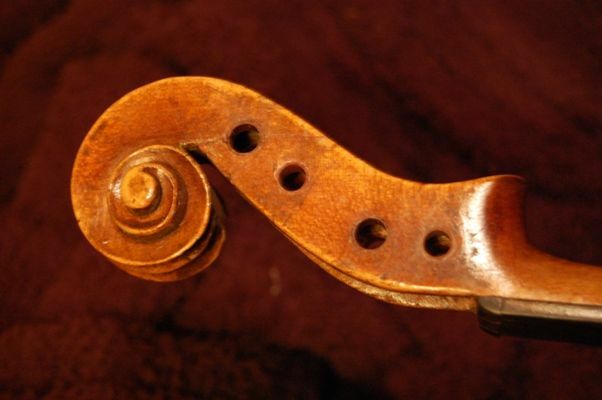 I knew nothing about violins, at the time, so I strung it up, and wondered why it sounded bad. I noticed there was a little piece of “dowel” rolling around in the case, and asked around…it turned out, of course, that the soundpost had been removed, and that was it. I took a stiff piece of fencing wire and sharpened it, bent it into an appropriate curve, and taught myself to set a soundpost. It still didn’t sound great, but it was great-great-Grandpa’s fiddle: thus, precious in its own right. Grandpa Green had sent me the original bow (repaired by some well-meaning amateur– (bullet-casing reinforcement around the shank where the button screws in, because of a crack, etc. ), but it had no hair, and was unusable at the moment, so he had bought an (extremely) cheap bow, and sent it along, as well. The case was just a typical, worn-out molded wood and fabric hard-case. Scroll, showing repaired A-peg crack, and spiral-bushed peg-holes. I played that fiddle off and on (mostly off) for a while, and the sound didn’t improve a lot, but it was acceptable, because…it was Grandpa’s fiddle. During that time, all three of my chidren were learning to play, as well. About a year and a half later, I heard my daughter playing a tune in the kitchen. The music was the same as she always played on her own violin, but it sounded different–considerably better, actually. So I walked in to see what violin she was using. It was Grandpa’s fiddle! I couldn’t understand why it suddenly sounded so good, so I took it from her and I tried it myself, thinking that it must simply be that she was a better player than I; but it sounded good for me, too. Evidently, part of the problem had been that the poor thing had sat neglected for 50 years, and had never been played at all during those years, so it took over a year of being under full string pressure, and sporadically played, for it to “wake up” and “remember that it was a violin.” It was quite an eye-opener. I had heard about the need for violins to be “played in”; probably had I played it more aggressively and much more frequently, the change would have come sooner. Good lesson there, somewhere. Years later, after I had begun building violins and other instruments, I took Grandpa Gray’s fiddle to Paul Schuback, a local expert (“local”, only in the sense that he lives and works near me– he is internationally reknowned as a violin expert), to see if he had any insight into the background of the instrument. When I opened the case, Paul’s eyes lit up. He exclaimed, “I know exactly where that came from…I’ve been there, many times.” He went on to explain that the cow-herders near Mittenwald, Germany, had nothing much to do in winter (as the cattle were safe in their lowland pens and barns for the season) so they made violins as a “cottage industry”. 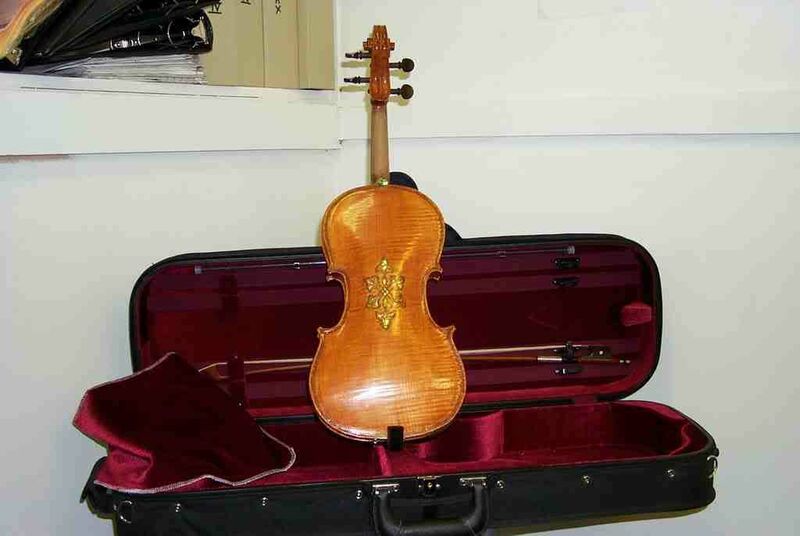 He had been there, personally, in the 1960’s or 70s, when the modern heirs of the practice brought in a gunny-sack (literally) full of unvarnished violins they had built during the winter months and sold them to the lutherie school at Mittenwald. The students there would complete the instruments, varnish them, set them up, and ship them to the USA for sale. The cow-herd made a little money, the school made a little money, the importers and dealers in the US made a little money, and the buyer got a cheap fiddle. Everyone benefited. I have no doubt that, if I opened the corpus, I would find that the front plate was extremely rough on the inside (“rough”, as in, “looks like chainsaw sculpture”) and that the bass bar is carved as part of the plate, rather than glued in separately. (As I say, I have met with this sort many times, over the last decade.) But I have no call to remove the top plate; only to repair the cracked pegbox…which I did do, eventually, and spiral bushed the peg-holes, so that I could intall new, better-quality tuning pegs. Other than that, I intend no changes. It is what it is… Great-great Grandpa’s Fiddle…and I’m the “Keeper of the Fiddle” for this generation. When I began building instruments, my first was a small viola, for my son, Brian. I knew that he especially liked Grandpa Gray’s fiddle, and I thought that the inlay was what he particularly liked. So I carefully copied the inlay pattern, and even took it a step further, cutting the abalone shell to fit the spaces, and filing them flush, rather than just jamming chips into glue, and filling the gaps with mastic. Added an abalone cap to the button, too. Lot’s of peculiarities, due to ignorance and inexperience. But it played well, and sounded pretty good…and it is a pretty thing, even with all the amateurish “oddness-es”. First instrument, a small viola, with abalone inlay and purfling weave. After I was nearly done, Brian was lovingly handling Grandpa Gray’s old fiddle, turning it in his hands and admiring its simple, rustic beauty. 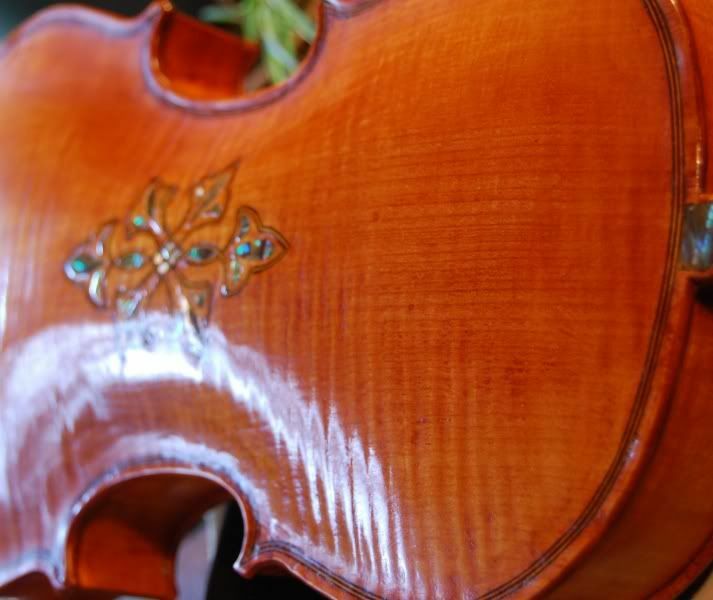 He said, “You know what I really like about this violin?” I said, “What?” and confidently waited to hear that it was the inlay…. You do have a very good way with a story. I enjoyed the knot at the ending. That knot has created a good memory for me, regarding Brian and that Fiddle. Nicely written Chet, and a great story. A good read to start the morning. I had forgotten that I had actually repaired that pegbox crack, until I got the fiddle out to take pictures. I need to go ahead and set it up again, and get playing on it. 🙂 I could use some mornings with a good cup of coffee, and a good session on Grandpa’s fiddle. What a great story. I love how in the end the Knot won out over the traditional thinking of “white and tight” being best! Makes me think a little differently about my wood choices nowadays. Thanks for looking. Love the story, Chet! I especially enjoyed the end, and how much the fact that it was your great grandpa’s meant to you! Your self taught craftsmanship is amazing! Kinda has that Bishop entrepreneurial spirit that your dad and our grandad demonstrated. Chet – Loved reading about that fiddle. I can remember Daddy saying that Grandpa Gray would play that fiddle at their “home away from home” where the Green children lived during the school year. Actually, I had forgotten that your Mom had a newer, better violin later on. Thanks for sharing the story. Thanks for being part of the story. You grew up listening to that fiddle– I never saw it until maybe 1982, or so, I think. Oh Its so Beautiful. If your wondering who I am ask Mag Edwards. I am a distant relative. I play the violin and my brother plays the viola. I would love to talk to you sometime. You probably know my dad Albert Martin Edwards the Third. Enjoyed looking at your work. I know your Dad as “Marty”, and have not seen him for years. Come visit sometime and both of you can play all you want.